The teenager tiptoes into the women’s restroom, trying not to eavesdrop on the conversation between Danielle, my mother, and I. She cannot contain her excitement. She says, “You’re amazing!” She tells me how I made her cry, asks where she can find more of my work, and almost stumbles going into her designated stall. When she comes out, I ask her if she’s a writer. She says, “Yes.” –(Rambles on about how she only writes love poems and could NEVER write like me.) I laugh. At 16, that’s all I COULD write, love being the priority of the teenage girls’ prime. I understand, nod, and wish her well. The scary thing about it all is I am usually the spontaneous-lecture-type, the-advice-giver, and the keep-on-writing motivator. However, for most of our conversation, I stood speechless. I am in awe of her admiration. I remember being about a year older than her sitting in a Def Poetry dressing room with Stacey-Ann Chin and DMX hyperventilating. Now, here I am, witnessing the same reaction towards me. I had to count my blessings this weekend. After running out of fingers and toes, I began to cry. I am beginning to love myself. This has always been a complicated task for me, the root of my love for writing, and the reason for my stanzas. My humility is derived from watching my mom beam with pride as I performed in a Princeton University Lounge; her fingers nervously grazed a program where her daughter and Cornel West’s names lay page by page. It is the casual conversations about publishing and writers block with Jewell Parker Rhodes, L.A. Banks, Courttia Newland, and Edwidge Danticat at the National Black Writers Conference. It is the faith of a professor who saw potential where others perspectives faltered. A professor who strived to humble me during my cocky freshman days and the same professor who now starts her sentences with, “this is one of our best students…” Perhaps it is a phone call from a senior who was astonished that she was analyzing my poems in class. 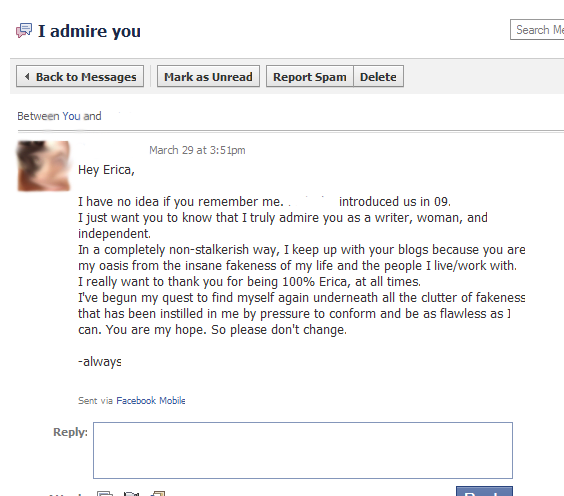 Or, a face book message begging me to never change. Through those inspirations I’ve learned to hone my aggression, fears, and issues for the stage. My role is here on this page, on this screen you’re staring at, or the stage that creates the perfect latitude of sound for your ears. It is within the glazed eyes of your listeners, the metronome of the applause, or an ecstatic fan in a bathroom, that the poet finds his/her place. You will ALWAYS find me right here. PS- This MADE my day. Awsome!!! I am soooo proud of you and so is your mother. I could see it in your mothers eyes that day. She had her chest poked out like a proud mother hen who had just pushed her chic out of the nest and saw it fly for the first time. She loves dearly and so do I! That was the weirdest analogy ever Danielle. Lol.